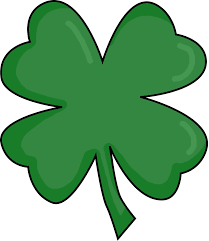 The month of March is known for St. Patrick’s Day and good luck. For the Majors, however, it is now known for success. So far this month, seven Millsaps student-athletes have been recognized for their athletic success and awarded the Southern Athletic Association’s weekly honors. 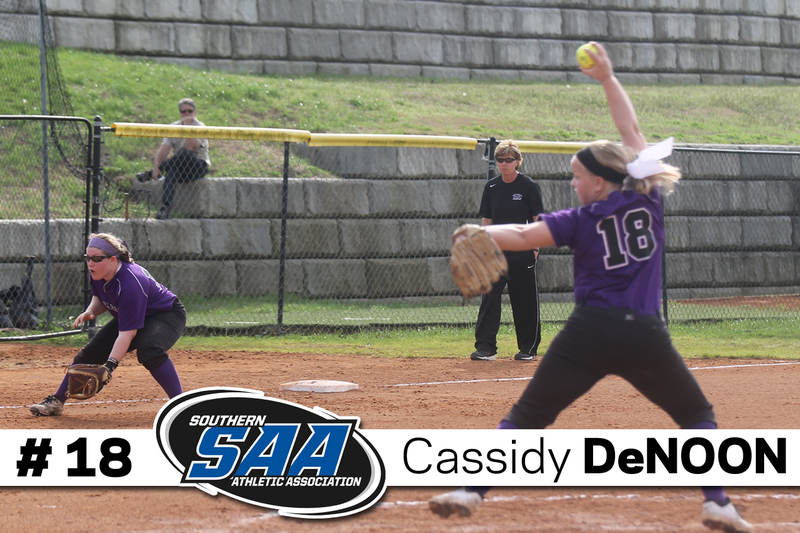 Freshman softball pitcher Cassidy Denoon won the Southern Athletic Association Pitcher of the Week award for her 2-0 complete game against Hendrix College on March 15. Denoon only allowed one hit in her seven-inning shutout. The Purple and White: How did it feel to win SAA Player of the Week? Cassidy Denoon: It was very exciting and definitely an honor! P&W: How do you prepare for competition? CD: I prepare for competition by staying focused and composed the best that I can. P&W: What is your work ethic? How important is work ethic? CD: I think that I have a good work ethic, and I think that it is essential for success no matter what you are doing. P&W: To what do you contribute your success? CD: My teammates and coaches have truly been there for me throughout this season and pushed me to be a better teammate and opponent. 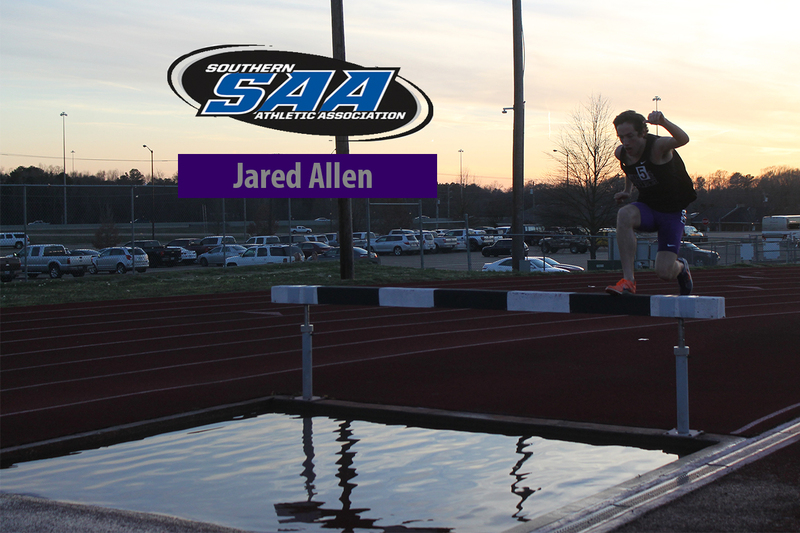 Jared Allen, a junior long-distance runner, won the SAA Track Athlete of the Week for his win in the 3000-meter steeplechase at the MC Open on March 7. Allen is the first male track runner for the Majors to ever win this award. The Purple and White: How did it feel to win SAA Track Athlete of the Week? Jared Allen: It felt great! It was my first steeplechase of the season and I executed my race plan for the week better than I could have hoped. [I also] set a huge personal record. I was honored to receive the award as there were many other great performances in the conference that week, many coming from my fellow teammates. JA: The days before race day are crucial. A few days before a race, I make sure I’m getting the sleep I need, eating and hydrating right, stretching out after runs a little bit extra, and going over my plan for the race. The way I see it, the race itself is going to hurt enough so I might as well make the things I can control as easy as possible through preparation. It’s so much easier to focus on competing with your opponents when you don’t have to worry about whether or not you prepared well enough for the race itself. P&W: How important is work ethic for your success? JA: Work ethic is extremely important in running. The attitude and work ethic you bring to practice during the week can make or break you on race day. Attitudes are contagious so showing up to practice every day ready to work creates a better environment and puts everyone in a good mood on the day of the meet. After all, the best runners are happy runners. JA: I would say a constant desire for improvement. A few years ago, I made it a goal that I would improve or learn something new about myself as a runner every week. [It] doesn’t always mean that I have to break my personal records every week. It could be that I improved as a teammate or prepared better or that I had better form over steeplechase barriers. Whatever it is, it keeps me from both becoming complacent with areas I need to work on and from being too harsh on myself for a race that didn’t go quite the way I would have liked. 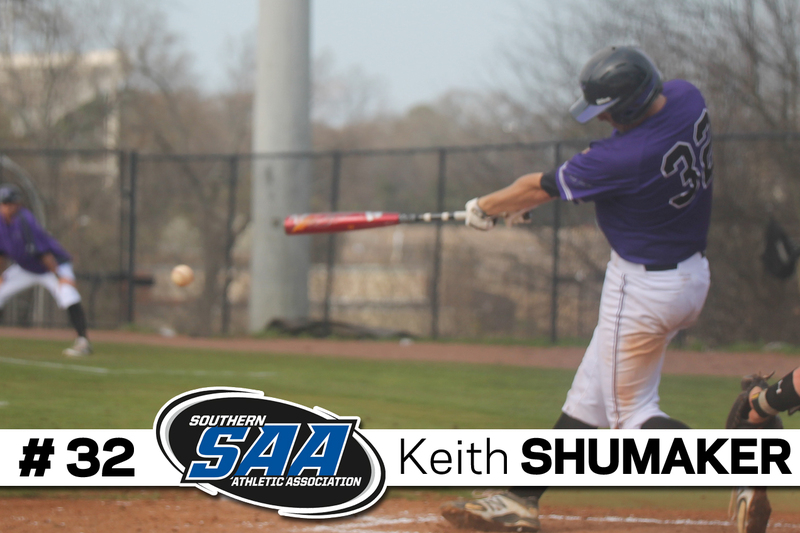 Keith Shumaker is a senior for the Majors baseball team. He earned the SAA Player of the Week honor March 18 for his efforts against Illinois Wesleyan and Oglethorpe. He was 9-16 during the four games with six runs scored and four runs batted in. Keith Shumaker: It felt great to help the team win three out of four games for the week. [I] had been struggling at the plate for a while and [it felt good to] finally come out of it. KS: It’s been tough preparing the past couple of weeks with all the rain, but when I am preparing I have to focus on the things [at which] I struggle. You can’t always work on the things [at which] you are good, you have to work at the holes in your game. KS: My work ethic is pretty good. Work ethic is extremely important because you can have all the talent in the world but not be as successful as you should be. KS: I contribute a lot of my success to my dad because all the [time and] work he put [in] to make me successful at baseball, all without burning me out of the sport I love. Coach Page is also a huge contributor because he has helped get my swing to where it is today, allowing me to be successful. 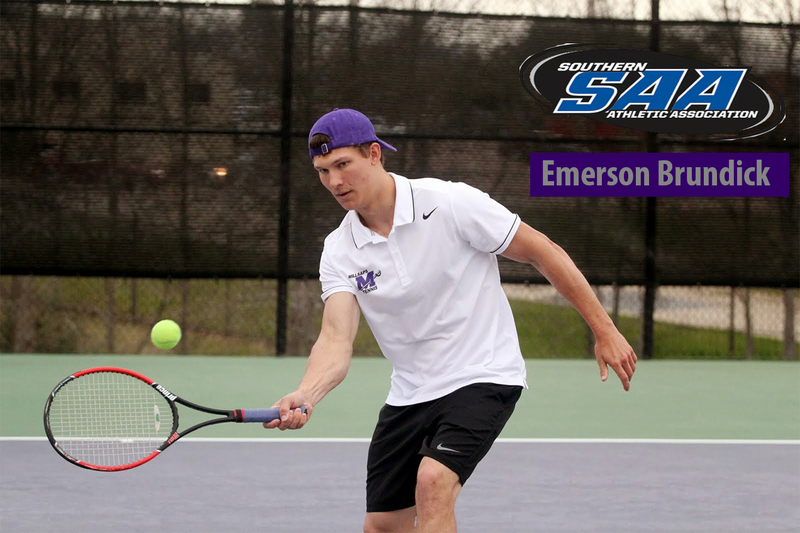 Emerson Brundick also won SAA Tennis Player of the Week, this time for the men’s tennis team. The junior had a dominant singles victory against Huntingdon. He also paired with Charles Rees in doubles for the deciding overall win against the Hawks. The Purple and White: How did you feel when you won the SAA Tennis Player of the Week? Emerson Brundick: It feels great! I was very happy when [Coach Box] told me I received the award. [It] was even better [because] I had won the award during the exact same week last year. P&W: How do you prepare for games? EB: I make sure to hydrate the night before [and eat a] carb-packed dinner . The morning of [a game] I eat a light breakfast of cereal, fruit, and yogurt. [Then] I like to zone out while listening to music. Clearing my mind is essential especially before a big match. P&W: How would you describe your work ethic? EB: My work ethic is really hard to explain. I am not a traditional student and my time is spread thin amongst work, school, tennis, fraternity and social life. Seeing as how I am time limited, it is extremely important that I achieve as much as possible during the time that I have. EB: I contribute my success to Coach Box. I had not played tennis in years before I came to Millsaps and if not for his patience and understanding I would not be playing tennis today. 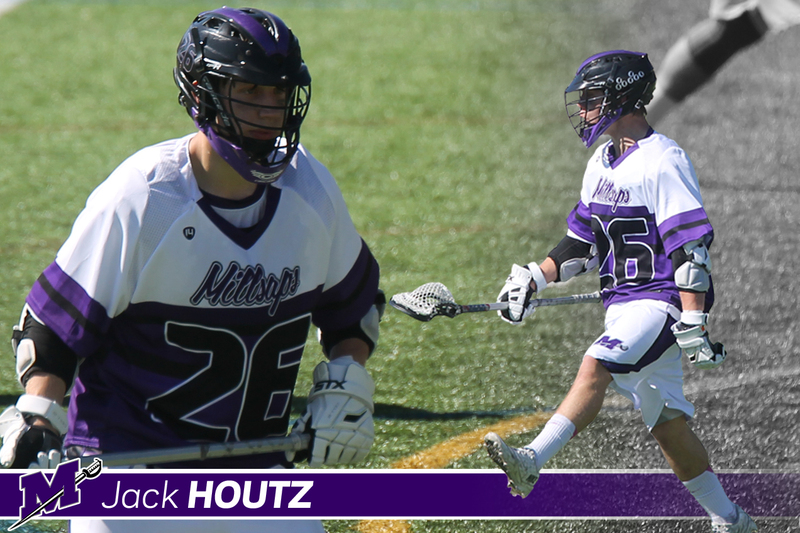 Junior midfielder Jack Houtz was named the SAA Offensive Player of the Week on March 10 for his success against the University of Dallas. He tallied six goals and one assist to help lead the Majors to a 19-6 victory. The Purple and White: How did it feel to win SAA Offensive Player of the Week? Jack Houtz: It’s an honor. Our lacrosse program is very young and is the newest sport on campus. Bringing recognition to Millsaps lacrosse is one of the best ways to [gain] respect for our team across campus and throughout the conference. JH: I prepare in the offseason and in practice. Other than [being] focused, there is nothing I can do on game day to make myself perform differently. P&W: What is your work ethic? JH: My work ethic is mostly discipline and repetition. [It can] apply to training, diet, staying healthy or time management as a student athlete. It’s [all about] being able to do the same things, the right way, over and over again. JH: I contribute my success to my teammates and coach Hoeffler. My teammates make me better in practice, and they are the ones that battle with me every game. Coach Hoeffler has been dedicated to improving our program and implementing a system where we can excel as a team during the season. During the offseason he pushes us with a rigorous weightlifting program and holds us to high expectations. [The] environment as well as the men on this team allow me to succeed. 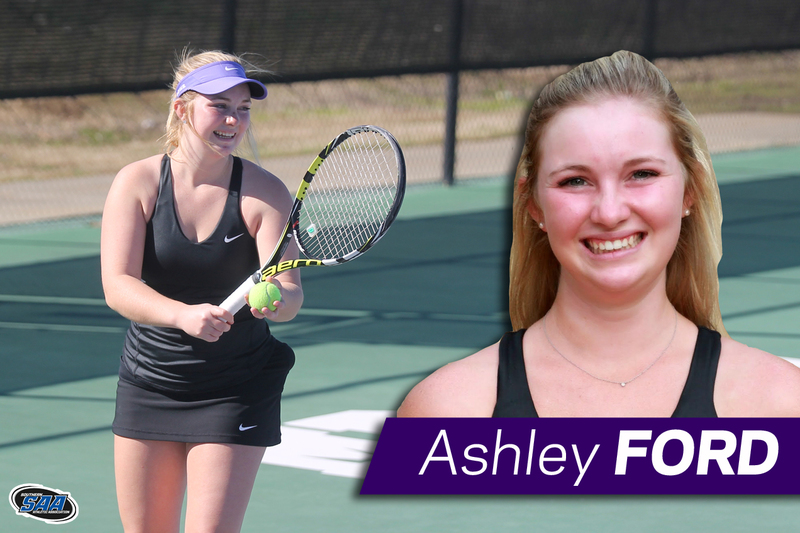 Freshman tennis player Ashley Ford won the SAA Tennis Player of the Week on March 3. She had the sole win for the Majors against number-one ranked Emory, along with a singles and doubles victory against Swarthmore.